Instead, this is a reminder about Friday Freebie! This is the 5th Tuesday of the month - meaning it is Tickle a Teapotter. I don't play in that circle so decided what I would do is remind you all of the current Friday Freebie. I will run this through Thursday May 2nd. I'll post the Winner on Friday May 3rd when I post the next Friday Freebie. If you love flowers and use them in your crafts, you'll LOVE the next giveaway so start spreading the word! 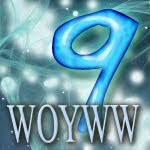 But more importantly, it's WOYWW! If you don't know what I'm talking about, Ms Julia Dunnit hooks up people from all over the world to share peeks into our work areas. To find out more about this fun travel around the world check out Stamping Ground for all the details. I've not played in a couple weeks. I've been on the go seemingly forever. 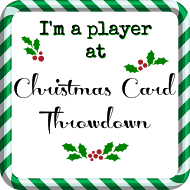 When I have been home and able to do some creating, I've cleaned up after the project so I didn't have to waste precious time cleaning up before playing. Yesterday I was able to make the TeaPot Tuesday card. I also glued the turned-in edges of the cover on the recycled book box. Behind the book box you'll see a black album. I won that 8x8 album in a silent auction a couple weeks ago. Next to that is a stack of books. These are a result of a treasure find while I was in Peoria IL a couple weeks ago. I love home improvement stores so while I was up north I took advantage of a stop at Menards. We don't have one near us since we moved to southern MO. However Bob can still access one in Bollingbrook when he drives up to Chicago where he works as a river boat Captain. I was on the hunt for some things I wanted him to possibly pick up when he went back to work. On a drive isle ( an outer isle within the store) I found a box bin full of books for $6 each. Aside from the usual hardbook fiction the box was loaded with scrapbook and card making books. $19.95-$24.95 books from Creating Keepsakes and Making Memories rang up for $5.97! I picked up five or six. I bought two copies of one book - one for me and one for Friday Freebie coming up soon. Speaking of Friday Freebie, you'll want to check back this week if you want organization ideas because one of the books I found is chock full of ideas for your crafting space... and will be FREE to one lucky person on Friday. I'm really glad the storms backed off so I could post today's Teapot Tuesday Challenge. 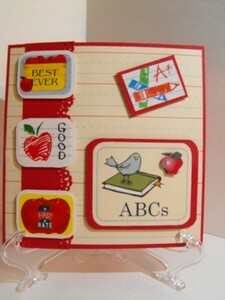 I had so much fun with this card, thanks to the wonderful Storytime DP from Stampin' Up. Must order more! The Kindness Club started in 1995 in Evansville (pop. 612) when Barb’s fourth-grade students decided to make get-well cards for a retired schoolteacher who became ill shortly after visiting their class as a guest speaker. Her subsequent thank-you letter prompted smiles and thoughtful reflection from the children. What an inspiration this woman is. You may read the entire story HERE. We were to bring apples for the teacher so I flipped through the pockets of my sticker album until I found some teachers stickers I've had FOREVER. You just never know when something will come in handy hehe. My collection included several apple-themed stickers. I did a 5-1/8 square card to fit an odd envelope using SU- Real Red for my base. The mat 'big chief' paper is from SU- Story time as is the ABC image. A strip of Real Red edge-punched with the MS Lace punch became my 'lace' to anchor the apple stickers on. And of course, Mrs. Bratvold and her class deserve an A+ for their dedication. Aside from this card, we were invited to share any of our 'extra' supplies with the class to help them in continuing their project. I believe my box of goodies will go into the mail early next week. My husband, Bob also enjoys golf though he doesn't get to hit the course as often as he would like. So I had the digi image of a golf bag and clubs from a card I did a couple of years ago. I deconstructed the image and paper-pieced it back together in David's favorite color combination. I used SU Garden Green as my base, accented with Pumpkin Pie DP and Wild Wasabi. The clubs are cut from Basic Gray. I used Wild Wasabi green to represent the green and Daffodil Delight marks the 18th hole. I hope this card brings a smile to David. Today's card is special to me. Pat is mom to Steve... my sister, Dona's, SO. A couple of months ago, Pat went into have some minor surgery that left her badly burned. Bad enough the story was covered on a local news channel. I knew instantly I wanted the Tea Potters to band together and shower her with positive thoughts as she looks ahead to the healing process and cosmetic surgery. Pat likes the color blue and loves flowers. I have this lovely Violet and Lily of the Valley stamp that seemed perfect. It is another one of those stamps that was issued before companies put their ID on them so I have no clue who makes this one. Some of the first flowers of late spring fill this heart-shaped wreath. Since I was using Violets, I played off their color and used SU Almost Amethyst (retired) rather than a blue. I stamped the image on GP White and colored it with Derwent WC pencils. 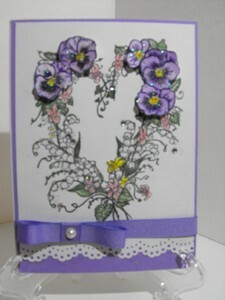 I stamped a second set of the violets and cut them out. Pop dots give them dimension. Although you can't see it well in the picture, I' brushed the flowers with iridescent Stickles and added some tiny rhinestones in various places. The edge of the GP is punched with the MS Lace border punch. I added a lavender grosgrain ribbon and bow with a pearl embellishment. Sending tons of hugs and blessings to a wonderful lady. MIXED MEDIA MONDAY - Thank You! Before I left home I tried to get some things caught up. 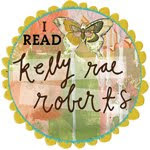 One project was to get a box of goodies shipped out to my SIL in Oklahoma... Kelly Bay. Remember, when I visited her last fall she sent me home with tons of goodies including stamp sets and my Score Pal. So before closing up the box I took a few moments to case THIS card from a Pinterest link. I can't remember what colors I used. Cheat sheet is at home. LOL But the DP is from MME and everything else is from SU. The medallion images under the buttons are from the new SU mini scallop set. The sentiment is from SU Thanks So Much. My card is a 4.5x5. I cut the mat strips 1.25x3.75. I seldom use bumpy elements on a card but this was going to someone I knew would appreciate the card and was being mailed inside a priority box so no issues with postage. I'll make more of these cards but without the actual button embellishments to keep in my stash. They are a great way to use up narrow strips from your stash. It's Wednesday! That means we get to spend the day cruising blogs all over the world to see what everyone's been up to this week. We call it WOYWW. To see what all the FUN is about, check out our fearless leader's, Julia, blog at Stamping Ground for all the deets. I am the opposite of Julia. I HAVE to have a clean space to work. When I'm in project mode, I'm usually good about putting my stuff away when I'm done. One time while attending a Make & Take at a local stamping store the visiting company rep said she needed me to travel with her just to clean up. Yep, I hung around after the M&T to clear the table in prep for the next round LOL So that explains my desk today. You can see the book box coming along. I've cut the center out of the pages away. That took about two hours on Sunday while enjoying my traditional Easter viewing of The Easter Parade with Fred Estair and Judy Garland. I've put the first step of the cover (front and back) in place. I need to glue the edges down then put in the inside mats. The card in the middle is one in progress for next week's Teapot Tuesday. I have an in on this one because I've nominated our next recipient. You'll be able to see it next Tuesday. The other card was this week's Teapot Tuesday card. You can see it in the previous post. I won't get much more crafting done this week. I head out on Sat. or Sun. for a 9-day writing retreat. If I leave Sat. I can catch the final 4 or 5 hours of the CK Convention in Collinsville IL. Not sure I want to spend an extra hotel night to have to rush through convention. I'm still in decision mode on that one. Hubby comes home tonight so I have lots to get done before he rolls in. But I'll have time to cruise blogs over the next several days. So show me what you've been up to! 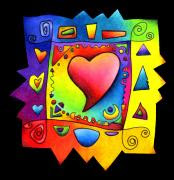 Creative Blessings for a great week! I finally was able to get to my work desk and join in the Tea Party this week. I am so excited. We were instructed to think gardens and bring vegetables. Well, I didn't bring vegies. Okay, I had carrots on the first card but as I was looking for a stamp to use on next week's card I found my favorite stamp to work with when the 'garden' theme is called up and had to make a totally different card. I bought this stamp several years ago at an LSS going out of business. Though you can't see them very well in the picture, there are multiple layers, making it appear as if Donnie could step right out through the garden shed door. watering can, pots, potato fork. First I layered the door frame on with strips of pop dot mats (you know, what's left after you remove the dots) Those long strips give a more solid base for the larger areas. Then I attached a brass brad where the doorknob image was and hung the door in place with pop dot strips on top of the frame. The watering can, pots and fork are all put in place with pop dots. I colored the image with Marvy Markers (the woods) and Derwent Watercolor pencils. I layered everything on SU Bashbul Blue because blue is Donnie's favorite color. Tomorrow is WOYWW and I FINALLY have a project on my desk! Whoo Hooo! I hope you'll come back tomorrow to see how the book box is progressing and a hint at next week's Teapot card! Yep... way off track. So far off track I'm not even at the depot. It's just been one of those mornings. The day started out great. I took an early morning drive into town. Saw a mother cow cleaning up a newborn calf, still wobbly on his legs as mom raked her big tongue across him. hehe Too cute. Got to the restaurant in town to check on the new ownership. Beautiful cowboy decor to match the owner's personality. Back up to write up my weekly column for the newspaper and let my editor know I am taking the next two weeks off. Then the fun began. Caught the outside cat in the bird feeder. So decided to take him food and refill the feeders. Okay so far. Then Bear, the Great Pyreneese decided it would be okay to come in the house and keep mom company while she worked. That went well until he investigated the bedroom... and Spirit, my precious house tom cat followed him... and wouldn't let him back out! LOL What a wimp. So Bear came out to lay beside Mom where he presumed it would be safe. Wrong. Spirit came out with us and had the nerve to approach Bear who decided the house wasn't big enough for him and the cat both and asked to go outside. Fair enough. I sit back down to work. And so it went for all of thirty minutes when Bear started barking towards the back of the property where we've had problems. Okay. I'll take the pistol and we'll walk back to check it out. And just in case it was a diversion to get me away from the house, I locked the doors. You know where this is going, don't you. Yep. I realized in the nano-second it took me to lock the door that my keys were still hanging on the fridge. Oh well, I already knew there would be only one way back in and went on the timber walk to find.... NOTHING! Not a thing to have Bear riled unless a deer had gone that way. Ever the Girl Scout, I am always prepared (okay, except for a spare key OUTSIDE the house somewhere), I got the tools out of my truck and preceded to remove the trim board from around the bathroom window, pull the screen away an break the window so I could unlock it and crawl through. Now, I'm in the house and Bob has an actual house repair project on his Honey Do list... a list I try very hard NOT to create for him when he's home. NOW I'm ready to sit down to work... What's that? Spirit brought Mommy a present. Apparently to tell me he has a size requirement for what he'll allow in the house. This time, a little brown mouse. The mouse goes out and he gets a treat. That's our trade. By this time I've decided I want as far away from the house as I can get and chinese food. So here I sit at my favorite coffee bar - HERO'S COFFEE in West Plains MO. I've had chinese buffet and now I'm enjoying a much deserved fluffy coffee. After while I'll go get a spare house key made and figure out a place to hide it OUTSIDE of the house LOL. And be home in time to torment Blake Shelton on twitter during TheVoice. Gotta take my frustrations out on someone LOL. No April Fools. Anyone who knows me knows I don't play that game!